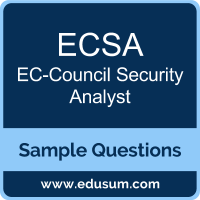 The purpose of this Sample Question Set is to provide you with information about the EC-Council Security Specialist (ECSS) exam. 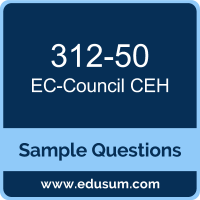 These sample questions will make you very familiar with both the type and the difficulty level of the questions on the ECSS certification test. To get familiar with real exam environment, we suggest you try our Sample EC-Council ECSS v9 Certification Practice Exam. This sample practice exam gives you the feeling of reality and is a clue to the questions asked in the actual EC-Council Certified Security Specialist (ECSS) certification exam. The purpose of this Sample Question Set is to provide you with information about the EC-Council Computer Hacking Forensic Investigator exam. These sample questions will make you very familiar with both the type and the difficulty level of the questions on the 312-49 certification test. To get familiar with real exam environment, we suggest you try our Sample EC-Council CHFI Certification Practice Exam. This sample practice exam gives you the feeling of reality and is a clue to the questions asked in the actual EC-Council Computer Hacking Forensic Investigator (CHFI) certification exam.